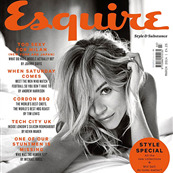 Really good profile of Sienna Miller in the new ESQUIRE UK. Helps that she knows the writer and that they have mutual friends. Because she’s candid, a lot more candid than we’re used to from celebrities. And part of that is comfort but, as the writer suggests, most of that is just…her. If it were Sienna Miller Johnny Depp was engaged to now, wouldn’t that make so much more sense? There is a lot of Kate Moss in Sienna. Just like there’s some Kate Moss in Vanessa Paradis. And some Paradis in Winona Ryder. But there’s no point to this because Johnny Depp ended up with Amber Heard who… is definitely not any of the above. She’s still flighty though. And impulsive. At least that’s how she comes across in this piece. I mean she talks about being grounded by motherhood and finding peace in her past volatile relationships – getting back together with Jude Law and ending up as lifelong friends – and re-dedicating herself to her career, but underneath it, that girl is still there. The one in the movie who keeps glancing out the window, who will always feel the pull. I wonder how long she’ll be able to resist it. Or if she can resist it now because she’s confronted some truths about herself. Sienna is refreshingly honest about what she called her lack of a “moral compass”. That, in her mind, in combination with youthful hedonism, accounts for many of her mistakes. There’s no blame-shifting, there’s no excuse-making. And on top of that she also admits to the attention addiction that comes with being an actor. I like this Sienna. The question is whether or not Sienna likes this Sienna and for how long.